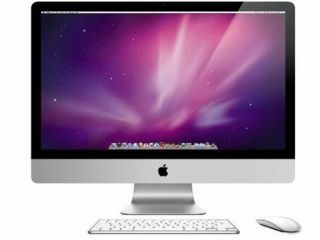 Apple has announced its new iMac range, with two different screen sizes of 21.5 and 27-inch options available as of today. In what many are claiming to be a cleverly timed PR move to coincide with this month's launch of Microsoft's Windows 7, Apple had made the announcements of the new iMacs alongside further announcements of a new multi-touch mouse and a refresh in the MacBook range of laptops. The only thing noticeably absent from Apple's new desktop iMac range is a Blu-ray player. This is something TechRadar informed you about just last week. Most of the other rumours flying around the internet in recent days were bang on the money, however. The new iMac displays are 16:9 and encased in aluminium, with LED backlit screens and Intel Core 2 Duo processors starting at 3.06 GHz, and Core i5 and i7 quad-core processors for up to twice the performance for power users. The new iMac line costs from £949 (inc. VAT), with every new iMac shipping with a wireless keyboard and Apple's new wireless Magic Mouse. "The iMac is widely praised as the best desktop computer in the world and today we are making it even better," said Philip Schiller, Apple's senior vice president of Worldwide Product Marketing. "With brilliant LED displays and the revolutionary Magic Mouse, the new iMac delivers an amazing desktop experience that we think customers will love."